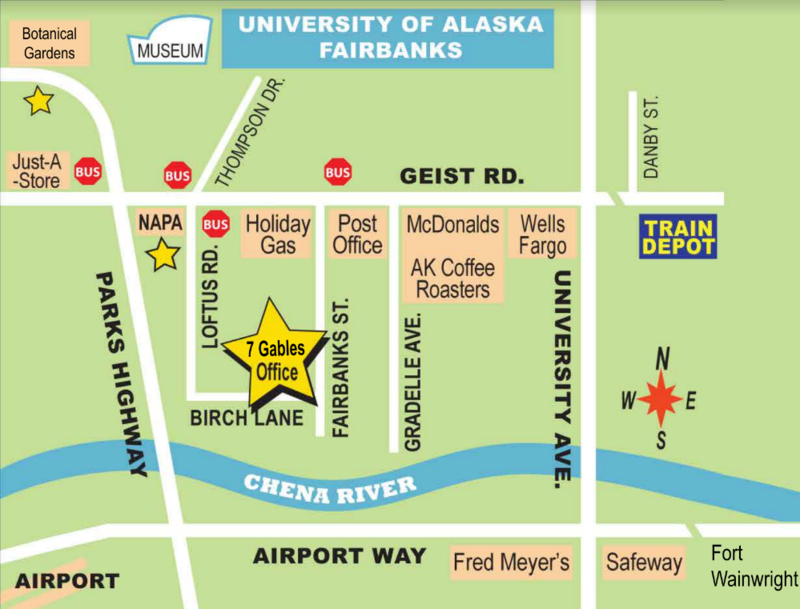 Leaving the airport, the first exit is “Anchorage/Nenana/Denali Park.”Proceed about 1.5 miles to the “UAF/Geist Road” exit. Turn right onto “Geist.” The next intersection to the right is “Loftus,” just past the blue NAPA Auto Parts, where you’ll turn right. Proceed down Loftus three blocks to Birch where you’ll turn left; 7 Gables Inn is one block down Birch on the left at 4312 Birch Lane. Turn right onto “Geist.”The next intersection to the right is “Loftus,” just past the blue NAPA Auto Parts, where you’ll turn right. Proceed down Loftus three blocks to Birch where you’ll turn left; 7 Gables Inn is one block down Birch on the left at 4312 Birch Lane.